A brief history of the Bexhill Community Bus from its start in 1980. The Bexhill Community Bus dates back to the 1980 cuts in support grants for public transport. Up to that time local bus services in Bexhill had been provided by Maidstone and District (M & D) Motor Services, who had a bus garage opposite the old Bexhill West station in Terminus Road. The cuts in support grant resulted in a drastic reduction in local bus services in Bexhill - and the closure of the M & D garage. Bexhill is well known as having a substantial proportion of retired people, many of whom rely on the local buses to get them into the town. The withdrawal of these services in 1980 was therefore a serious issue and one that could have had a detrimental effect on the quality of life of many people – as well as an adverse effect on businesses in the town. At the inspiration of a number of local people led by retired local businessman and vice-chairman of the Bexhill Council of Voluntary Services Doug Upton, a study was mounted into the funding and running of an independent, volunteer-run, local Community Bus. Information was obtained from a number of sources, including government publications on Community Transport, advice from existing Community Bus operators and “Dial a Ride” schemes. A number of options were evaluated, resulting in the conclusion that a local “stage carriage” bus operation was viable and funds were sought from a number of sources for the purchase of a suitable vehicle. At the same time, volunteers were sought to operate and run the service. Recruiting posters and application forms were displayed around the town and public meetings were held to discuss the proposals. Much effort went into planning and agreeing the routes, producing a timetable and calculating a fare structure. Funding of the bus was eventually secured by way of grants from East Sussex County Council and the Ministry of Transport, plus substantial local fund-raising. A 16-seater Reeve-Burgess minibus on a Ford Transit chassis was purchased at a cost of almost £20,000 and a host of volunteers were recruited. Although PSV driving licences were not required under the Ministry of Transport’s Community Bus Permit scheme, all drivers were trained and assessed by qualified bus companies. Services commenced on 13 September 1980 with one bus covering four separate routes. Up to then Community Buses had only operated in rural locations; Bexhill’s was the first to operate in an urban environment. 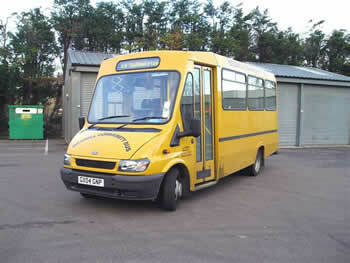 For the first two years, until a second vehicle was purchased, East Sussex County Council provided an elderly “G” registration crew bus to cover for emergencies, maintenance etc. A second bus was purchased in 1982, again with some assistance in the way of grants from the then Ministry of Transport and East Sussex County Council, but this time with a substantial input from revenue generated by the operation of the bus. The Chairman of Rother District Council Don Kimber cuts the tape in front of the De La Warr Pavilion to mark the inauguration of Bexhill’s Community Bus Service. The capital grants from East Sussex CC and the Department of Transport were both subject to pro-rata repayment if the service had to be withdrawn in the first 5 years. If this was a concern, the instigators need not have worried! The bus was an instant success. Local businesses were encouraged to donate prizes for the 100th, 500th and 1000th passengers and these were all awarded within the first two weeks. At the end of the first month of operation over 3000 passengers had been carried. Many compliments were received about the usefulness of the service and the friendly atmosphere - in particular the fact that, outside the town centre, the bus would stop anywhere along its route. Before long the initial “driver-only” arrangement was augmented by a conductor to take the fares, help passengers to board and alight and assist with their shopping trolleys. Over the years the operation of the bus went from strength to strength and the service became well known around the town. By June 1990 the bus had carried 500,000 passengers. Another milestone was reached in February 2000 when the magic figure of 1,000,000 was reached. 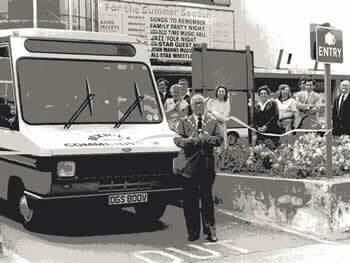 By the year 2005 the Bexhill Community Bus was able to celebrate a quarter of a century of operation. The Bus had long since become fully self-funded, all grants from statutory bodies having been long since phased out. The Bus is now dependent on fare revenue but is fortunate in having received many generous bequests from former passengers. A number of changes have been made over the years. Routes and timetables have been revamped several times and a much-simplified “flat fare” structure was introduced in October 2002. The current mileage for the stage carriage service is some 500 per week shared between our two vehicles. Passenger journeys are between 800 and 1000 per week. Volunteer crews work a half-day shift and can offer to work as few or as many shifts as they wish. After many years without proper garaging facilities, Rother District Council made a parcel of land available in October 2000 for a peppercorn rent. With the aid of significant donations from the Bexhill Friends of the Elderly and the Friends of Bexhill Hospital, a purpose-built 4-bay garage was erected and commissioned in April 2001. The garage provides protection from the weather and proper security for our vehicles. Two of the bays are rented out to the Bexhill Caring Community.